This article originally appeared on ComoLagoBike 29-October-2018. Is your guide certified? Our ComoLagoBike guides are already chosen for their decades of cycling experience, and the temperament and leadership that gives them a professional advantage when guiding our guests. 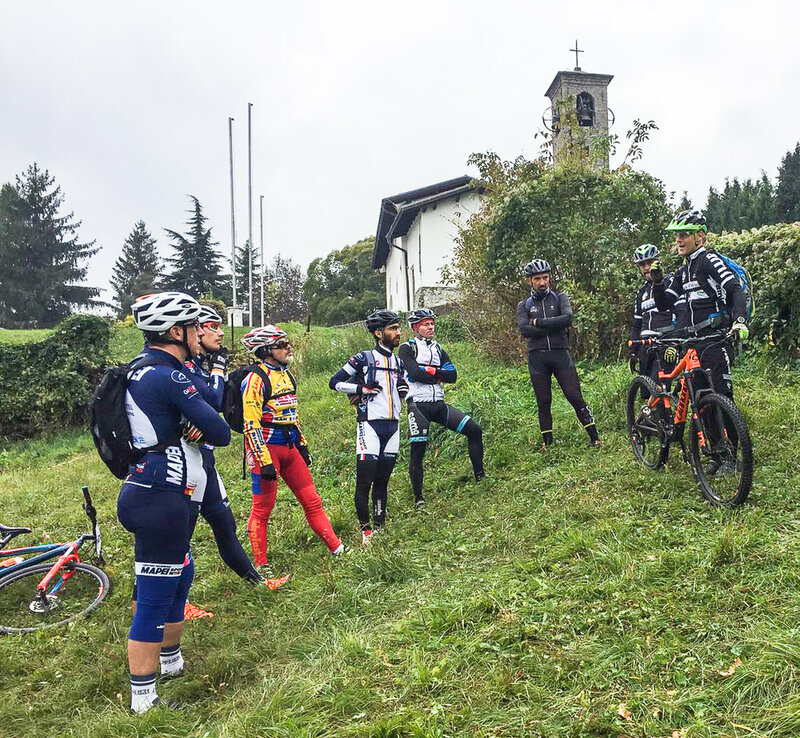 This past weekend Alberto, Athos, Lele, and Umberto advanced their skills even further with a 4-day guiding course led by Italy’s top mountain bike leadership school, AMIBIKE. 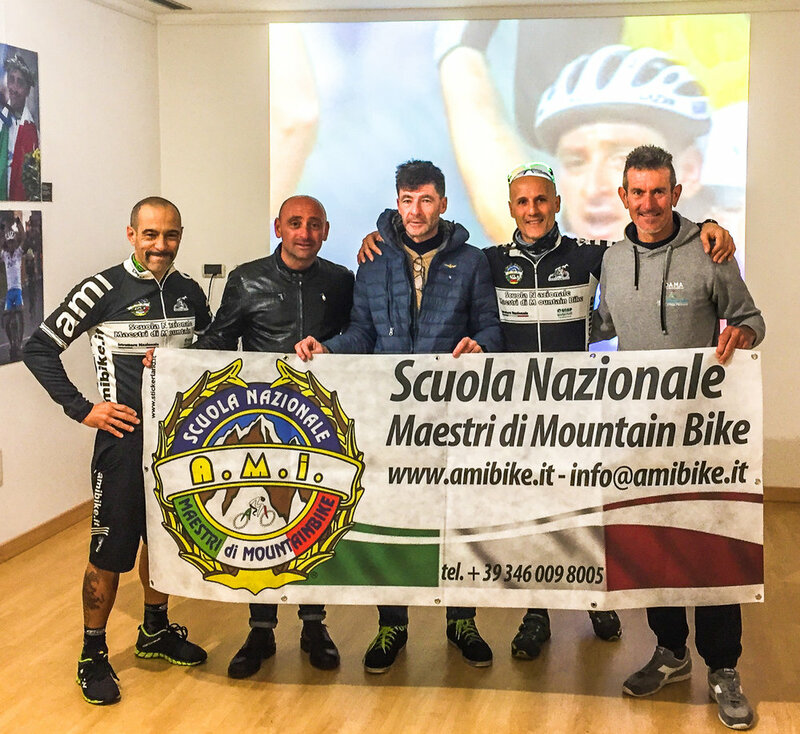 Since 1997 the Associazione Mountain Bike Italia has proven itself for a record for professionalism in teaching and developing mountain bike guides around the country. The class was organized by Italy Bike Hotels, which are an accredited network of hotels around Italy that cater to cyclists and provide amenities such as guides and rental bikes. Italy Bike Hotels puts together a course every year for its hotels’ guides to earn certification for qualified professional guiding. Hotel Il Perlo and its owner Carlo were the local Italy Bike Hotel organizers of the course. 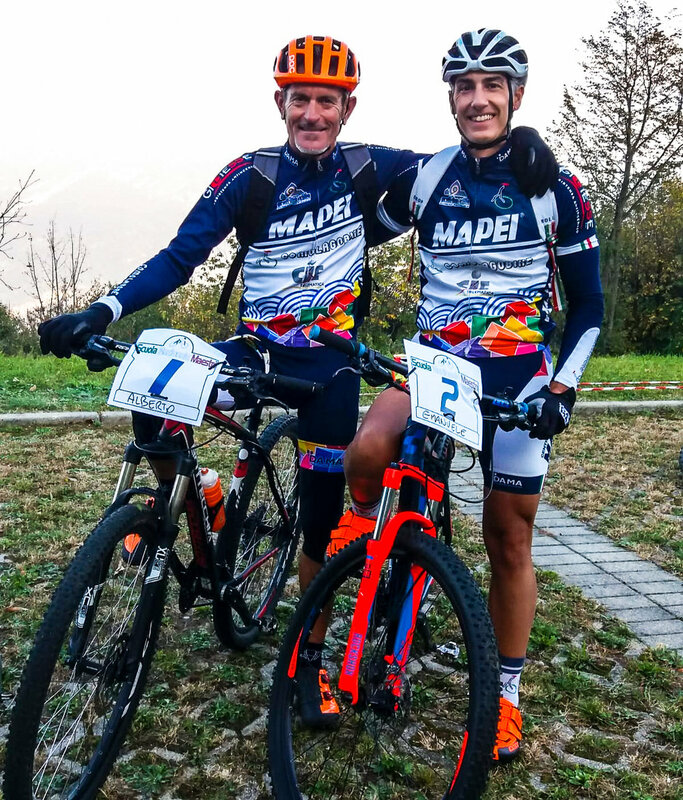 Italy Bike Hotel President, Andrea, from Dory Bike Hotel in Riccione also attended along with Gianni from Soave Best Western Bike Hotel near Verona. Indoor lectures were hosted at the Ghisallo Cycling Museum and outdoor exercises were practiced on the grounds nearby. This course ensures that Italy Bike Hotels have qualified, safe, and certified guides working with the same standards throughout their network. Sucessfully obtaining the certificate means that the guides are certified not just for being mountain bike guides, but for expertise in technical skills, mental attitude, and behavior as a guide. Having this certificate means they take pride in their guiding service and are attentive and responsible to their clients. Those who achieve this certificate are proven to have the right constitution to challenge themselves with new topics, are humble to improving their weaknesses, and are aware of the importance of becoming qualified in their profession. 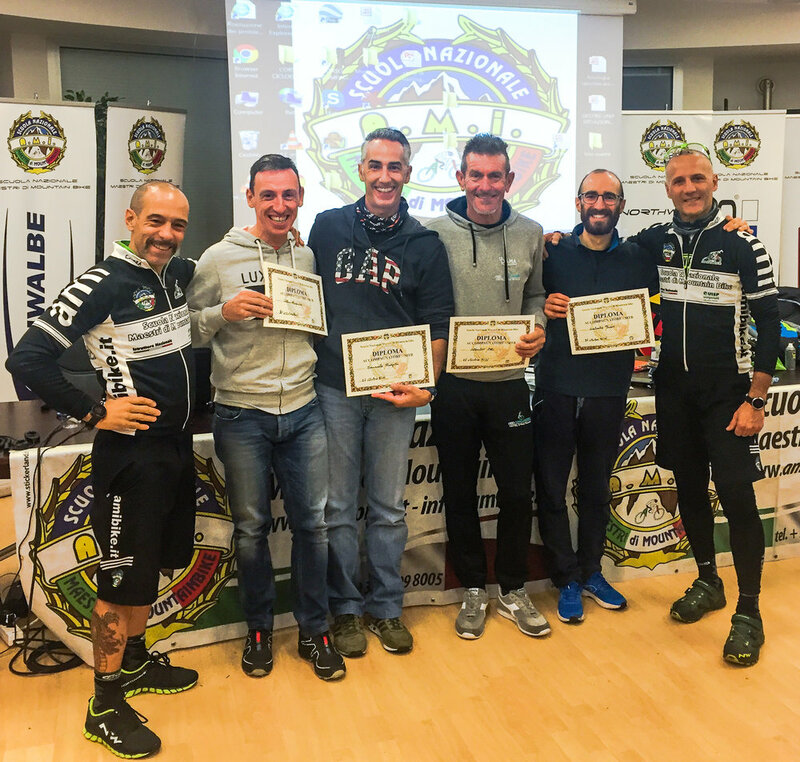 The Diploma Accompagnatore MTB certificates were not handed over merely by attendance. At the end of the course was a written exam of 39 questions to ensure that the guides had listened attentively and that they took this course and its prestige seriously. As an added bonus to the long successful weekend, our instructors and guides were met by racing legends Paolo Bettini (Olympic, 2x World, 2x Italian, and 2x Il Lombardia champion) and Gianni Bugno(2x World, 2x Italian, and Giro d'Italia champion) who caught up with their former professional competitor Alberto Elli while visiting the cycling museum. Now with this more extensive training we are ready to make the outings with clients, wonderful tours to discover our territories in complete safety. Many thanks to Frank and Andrea, Amibike teachers, for their professionalism and competence. Those gratitudes extend to Italy Bike Hotels, AMIBIKE, the Ghisallo Cycling Museum, and Hotel Il Perlo and Carlo for putting this course together and making the four days so successful! We look forward to bringing these continued services of excellence to our guests in the years to come.